You can integrate Axcient Replibit with your ConnectWise PSA. Once enabled, alerting events trigger tickets within the PSA. Ticket status is synchronized in both directions with the corresponding alert. 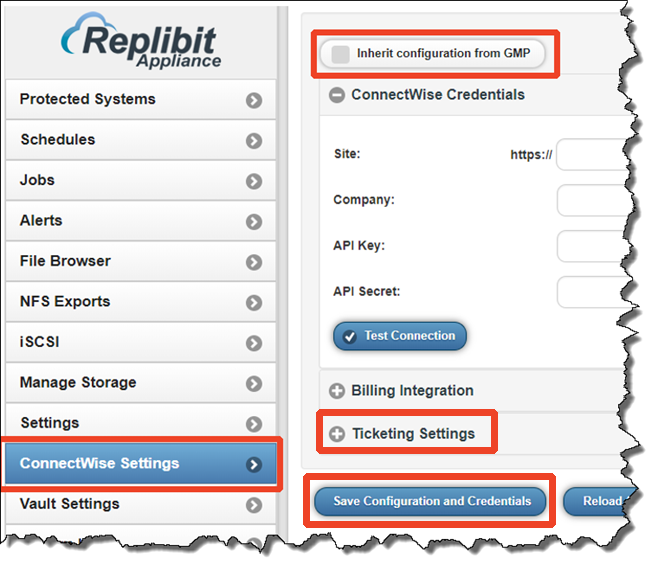 We recommend that you contact Replibit Support for assistance when enabling and configuring ConnectWise Integration settings. In the menu pane, navigate to ConnectWise Settings. In the Site field, enter the URL to your ConnectWise site. In the Company field, enter the Company Name. In the API Key field, enter your API Key. In the API Secret field, enter the API Secret. Click the Test Connection button to verify that your credentials are correct; then click the Save Configuration and Credentials button. To enable Billing integration for an Appliance, expand Billing Integration and click to select the Enable Billing Integration checkbox. In the Select a Company dropdown menu, select the Customer to whom this Replibit device should be billed. In the Select an Agreement dropdown menu, select the Agreement that you created within ConnectWise for this service. The Agreement should contain a definition of the monthly fixed billing for this device. In the Addition dropdown menu, select the Addition that you created within ConnectWise for this service. Replibit will update the Addition within ConnectWise with the total amount of Storage (in Gigabytes) being consumed on all Vaults by all Protected Systems hosted on this Appliance. Storage used by Protected Systems being replicated to multiple Vaults will be reported cumulatively. The Addition should be configured within ConnectWise with the off-site Vault per-Gigabyte charge (if any) that you wish to bill this customer. To enable ConnectWise Ticketing, expand Ticketing Settings and select a company from the Service Ticket Company dropdown menu. Replibit ticketing integration with ConnectWise is granularity configurable per event type. 1. Check the Enable checkbox. 2. Select a Service Board, and then select the ticket status you would like to assign for New and Closed tickets of this type. All ticketing event classes are optional and you need only configure the types of events for which you wish to receive tickets within ConnectWise. 4. If you wish to enable Billing Integration, this must also be manually enabled and configured, as selections for each appliance will be unique. 5. Click Save Configuration and Credentials to complete your changes. When you have completed configuring ConnectWise on your first device, you can export the settings to a file and import them when configuring subsequent devices. In the ConnectWise Settings menu pane, click the Import Settings button or the Export Settings button, depending on your needs. The ConnectWise Policy settings within the Global Management Portal (GMP) allow you create a default configuration for settings to be applied globally across all devices. Once you have configured each of your devices to inherit their settings from the GMP, future updates and changes to managed settings can be performed from the GMP.